Weeks before the release of SUICIDE SILENCE's self-titled fifth album, the band found itself under scrutiny with its preview track, "Doris". That's the polite way to put it. Vocalist Eddie Hermida and guitarist Mark Helymun took to MetalSucks.net with a video cam and printouts of some of the negative Internet posts cast against the group; its members fought back. For 18 minutes, Hermida and Heylmun singled out haters by name—or their online pseudonyms—and dished their own blasé and sometimes comedic retaliatory rants. "Trolling's at an all-time new level," was the presiding sentiment from a band that's already gone through hell following Mitch Lucker's 2012 violent death. Hate to say, they speak the sordid truth. Call it unprofessional if you like, or tell these guys to square up and play their music, but this is a sign of things to come. It's no secret metal fans (to generalize) thrive on bitchery, particularly toward bands that don't meet their own subjective measures. Thus, cowardice largely held unaccountable equates into reprisal through other means. The fact members of SUICIDE SILENCE took 18 minutes of their time to snipe back at those who use a keyboard to brawl is telling of a number of things. Most importantly, it highlights the snide defense of its new directions on this album, which will stun most of the band's fans. So let's start with the controversial track in question, "Doris". For all the nastiness slung by the internet users, this is indeed a new course for the band. It rumbles, it seethes and for those tossing out KORN comparisons, they're absolutely there. Eddie Hermida swaps between his agro ralphs and an unambiguous facsimile of Jonathan Davis at times with wriggles writhing about his clean portions. The consensus thus far has taken Hermida to task over his clean vocals, and if that applies to you, then double-back at once to "No Time to Bleed". For those who've teed off against "Doris", you're sure to equally hate "Silence". It mirrors the same KORN methods, only with less discipline behind Eddie Hermida's hollering. His clean vocals are actually more interesting, despite protestors against the use of them. Nonetheless, "Silence" turns into a noisome clutter toward the end, which is its bigger fault versus the clean-sung indictments thrown at the band. The vibrating bass and guitar on ""Listen" once again mirrors KORN on the verses, though the slinking groove gives the track muscle. Eddie Hermida sticks mostly in screaming mode—even if he's raving more than singing. 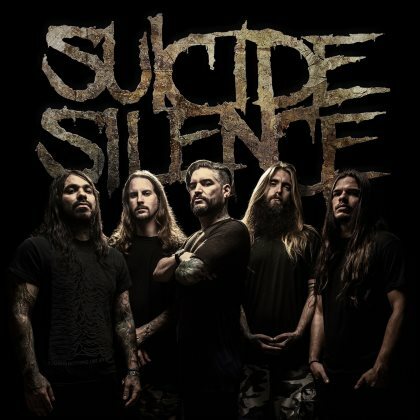 SUICIDE SILENCE at least drops a good progression to steer "Listen" into a moody finish, picked up by the dirge ballad, "Dying in a Red Room". Here, Eddie Hermida croons flat out and, if you're already unnerved by this blunt changeup to his and the band's style on this album, you'd best get over it or get moving onto something else. "Dying in a Red Room" makes no pretentions in seeking fresh tones, but it does become ugly to a fault, much as the initial doings are intriguing and atmospheric. The rambunctious "Hold Me Up Hold Me Down" is where longtime fans will catch on as Dan Kenny's bass all but engulfs the number—aside from Eddie Hermida's gibbering ruckus. This one becomes yet another KORN clone until heading absolutely nowhere amidst a befuddling stretch of strung-together deathcore modes, including irksome retching from Hermida. By the time the substandard "Run" arrives, it's become evident SUICIDE SILENCE has tried too hard to push out of its mold, following KORN's playbooks to the unit's own bitter end and stumbling in its own way. Internet trolls may have the filter skills of a floundering rookie at a slam event, but they have it right in the basic sense with their crude assessments—minus the DEFTONES comparisons: zilch to be found here. Whether you like this album or you're one of the many casting digital stones, we've hit a repulsive point of no return. Yes, this album's a freaking mess and SUICIDE SILENCE is going to find themselves rolled into a big enchilada of animosity following an inevitable mass rejection campaign. The final track, "Don't Be Careful, You Might Hurt Yourself" is the album's epitaph. When bands start fighting back against hecklers instead of turning the other cheek, we're witnessing a bleak dawn to how royally fucked up this scene has become.